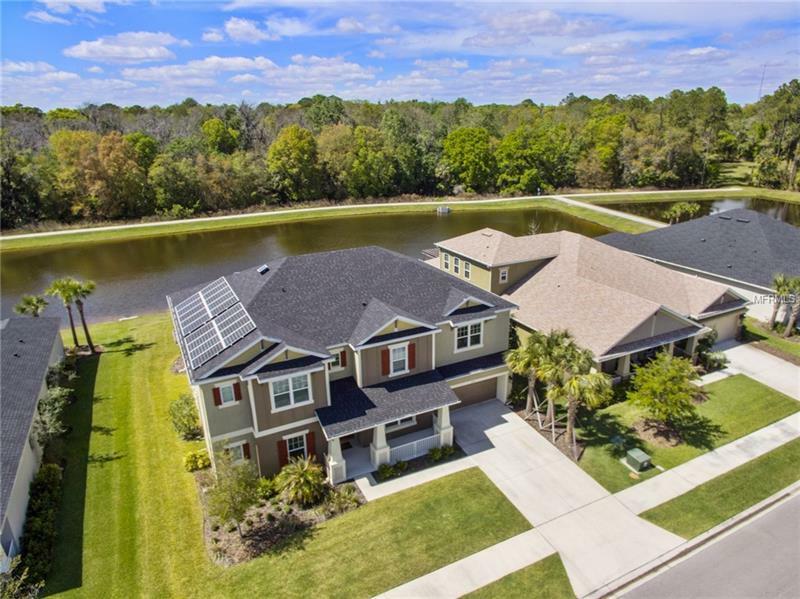 Stunning views from this pond waterfront like new executive estate located in Arbor Woods of Wesley Chapel. Conveniently located minutes from Wiregrass Mall I-75 and I-275 Bruce B Downs and much more. Nearly 4200 sq ft of living space in this 6 bedroom + study + media room + loft 3.5 bathroom open layout home with a 3 car tandem garage. New screened in pool overlooking backyard pond with brick pavers and plenty of seated area. Solar panels mean your electric bill is only around $10-$20 per month! This 3 year old Taylor Morrison built Hemingway III model cannot be replicated in a new build â no lots compare! Owners have kept it in pristine condition. This home features ceramic tile and wood flooring upgraded kitchen appliance package oversized kitchen with plenty of storage and 2 islands with granite counters reverse osmosis system in kitchen. Dramatic 2-story foyer and family room. Owner upgrades done include wood flooring on the stairs master and upstairs areas solar panels pool and new light fixtures throughout. Wesley Chapel is one of the fastest growing areas in Tampa Bay and features communities with million dollar plus homes just a few miles away. Donât miss this opportunity!